Haven't you ever wondered how larval invertebrates in the ocean orient themselves? The answer often lies in a small balance organ called the statocyst. A statocyst is a fluid-filled spherical capsule containing a small stone, or statolith, and sensory cells that detect the position of the statolith. Statocysts tell the organism which way is up, and, in some cases, how fast it is moving. This is a recently hatched juvenile of the ctenophore (comb jelly) Beroe sp. At the aboral pole (up, opposite the mouth) there is a dome made of cilia - the equivalent of the statocyst capsule. Inside this dome you will note an aggregate of small marbles - that is the statolith. This aboral sense organ detects gravity and controls the movement of comb rows (ctenes) and the ctenophore’s orientation. The statolith rests on four tufts of support cilia, connected via ciliary grooves to the ctene rows. Tilting changes the gravitational pressure of the statolith on the support cilia, which ultimately controls the beating rate of of the ctenes. Differentially beating ctenes on one side allows the animal to turn and return to vertical position (Hyman 1940). This is a veliger larva of the nudibranch Diaulula sandiegensis (which hatched in the lab after we collected the egg mass off a dock in the Charleston marina about a month ago). At the anterior end (up) you will note a ciliated appendage - the velum, with which the larva swims. Below it there are two statocysts. Each contains a single statolith. Statocysts form during intracapsular development, in the late trochophore and early veliger stages in gastropod mollusks (Hyman 1967). 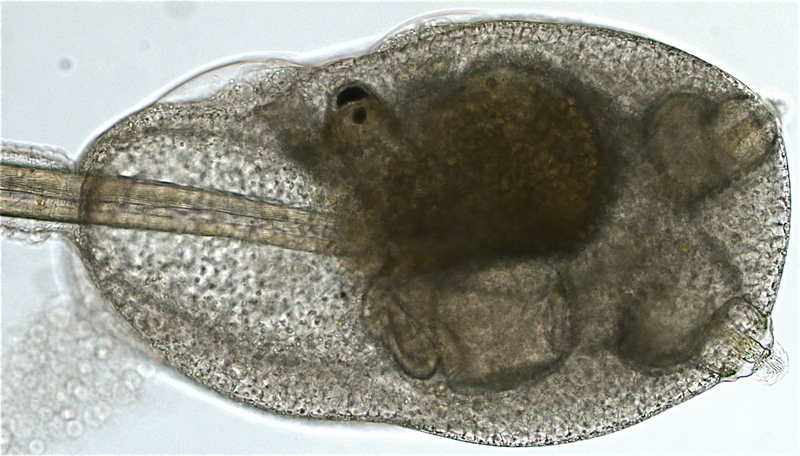 Here is another kind of balance organ in an ascidian tadpole larva. This tadpole was released by the colonial ascidian Distaplia occidentalis. In ascidian tadpoles the balance organ is called a statocyte, and occupies the bottom of a sensory vesicle, which also contains a light sensing organ - the ocellus or eye (Cloney et al. 2001). The statocyte contains a single melanin granule, the statolith. Both the statolith and the ocellus are visible on this picture. The ocellus is the black crescent shape, while the statolith is the black round shape underneath. These two organs are involved in the perception of environmental cues that drive ascidian tadpole behavior (Zega et al. 2006). Cloney RA, Young CM, Svane I. (2001) Phylum Chordata: Urochordata. In:Atlas of Marine Invertebrate Larvae. Academic Press. New York. P. 567. Hyman, L.H. (1940) Protozoa through Ctenophora. The Invertebrates. Vol 1. McGraw-Hill, New York. P. 665-8. Hyman, L. H. (1967) Mollusca. The Invertebrates. Vol VI. McGraw-Hill, New York. P. 471, 548, 583. Zega G, Thorndyke MC, Brown ER (2006) Development of swimming behaviour in the larva of the ascidian Ciona intestinalis. J Exp Biol 209: 3405-12.